My brother got engaged recently and I had to indulge in the shopping spree in these hot summers. I got amazing stuff from the market but at the cost of my skin that got tanned badly. Then, my friend suggested me to use VLCC Anti Tan Skin Lightening Face Wash. I must say this one is a very effective face wash that helped me get rid of my tanned face within a few days of application and I am so happy using it for three months now that I am here writing a review for it. Use Anti Tan Skin Lightening Face Wash once and you too will fall in love with this amazing product of VLCC for the superb effect it leaves on your skin after every wash. Using this face wash, I feel like my face has got rid of all the dead cells and dusts within a minute without paying those heavy bills in a beauty parlor for a facial. Unlike other similar products in the market, this face wash from VLCC truly fulfills what it claims and that is a soft and lightened skin after every wash and since I am regularly using Anti Tan Skin Lightening Face Wash since three months, the effect is all the more visible. Regular use of VLCC Anti Tan Skin Lightening Face Wash helps cleansing your skin deeply clearing it away from all the skin impurities and tanning caused by the harmful sun rays. Once you will start using it, you will yourself notice how this face wash leaves your face refreshed and oil free with a clear skin tone. 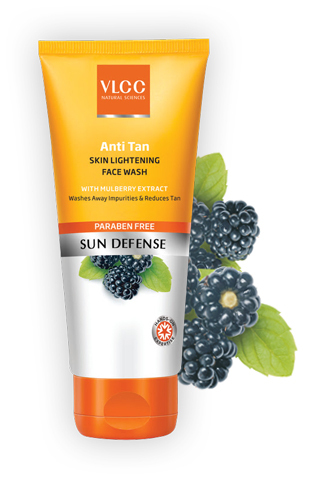 Mulberry Extract is one of the main ingredients used in VLCC Anti Tan Skin Lightening Face Wash for its effectiveness in lightening the skin tone. Tyrosinase in the mulberry root is known for its gentleness on the skin making it smooth and soft and this is the main reason for the makers to add this extract in making this face wash; so that the skin doesn’t face any irritation even after daily use. Kiwi Fruit Extract that is known for improving the skin radiance and removing the fine lines is also used in this face to help you get rid of the dark spots especially under the eye. This is not all; you get a proper balance of Vitamin C along with Honey for a proper protection against ultraviolet radiations and soothing as well as moisturizing effect. In terms of the chemicals used in VLCC Anti Tan Skin Lightening Face Wash, Decyl Glucoside is the chemical used for proper foaming and cleansing in this face wash along with a proper balance of Cellulose. 4.5 out of 5 is the review rating received by VLCC Anti Tan Skin Lightening Face Wash for its effectiveness on skin by a majority of users. Easily available at a pocket friendly price of Rs. 95, a 50 gm pack of this face wash can be easily carried anywhere you go in your bag for an instant glow on your face.